Now that both sheets are nested, the next step will be how we choose to hold down the parts while they are being cut. Both the seats and back are two small and awkwardly shaped to be held down by vacuum pressure alone and we do not want to screw down our parts because of the holes it would leave. Our solution is to use tabbing and to hold down the remaining parts with screws. 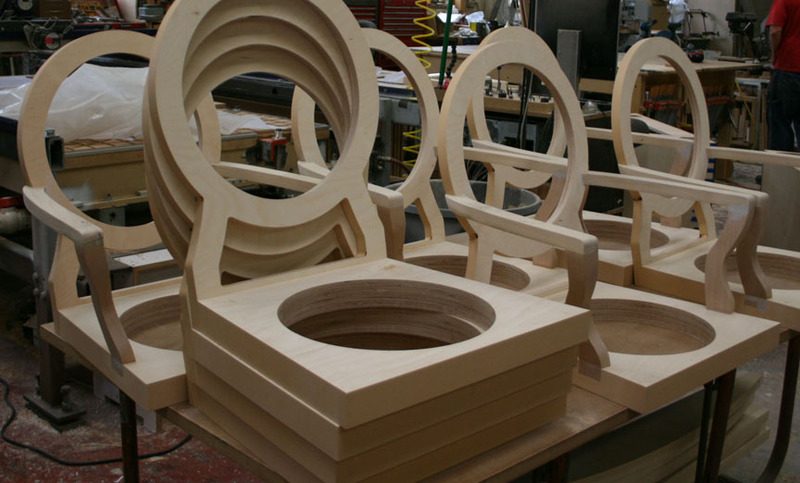 Since the seats are so closely nested together we will need to add the tabs to the inner circles and screw down the circle pieces to the table. (The inner circle cut outs are useful in creating a hold down system, but mostly they remove excess weight in the chair that would be a real inconvenience in the final product.) In the backs we can add tabs to the outer perimeter since we can screw down the excess pieces that are left around the parts. Make a closed line where you want to pocket out the slot for the arm connections. Nest the backs facing down, so the part that your back would rest on is against the table. Make a closed line around the perimeter of the piece making sure to include a slot where the upper part of the arm meets the chair. Create a line that will generate a toolpath for a step in the inner circle. Add tabs to the outer edges of the piece since you cannot add them to the inner circle because of the step that will be cut. 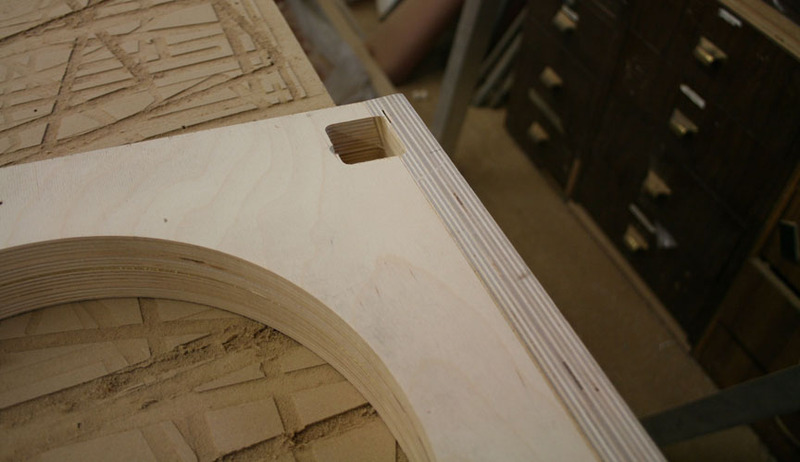 We will use a Compression Bit for all of the toolpaths on these parts because it will not tear out the top or bottom layers of the plywood during cutting. We are using two different sizes of Compression Bits, one for 2” sheets and one for 1” sheets. Make pocketing cuts for the arms in the Seats. Make the profile cuts around the inside circles including the tabs. Make the profile cuts around the outside of the parts. Make the interior circle profile cut. Make the profile cuts around the outside of the parts including the tabs. Before we make the Motise holes for the legs we need to attach the seat to the back. Use a table saw to cut the complementary angles along the bottom of the Chair Back and the rear of the Chair Seat. Now we need to set up a jig on the backside of the CNC table to cut the Mortise holes in the bottom of the assembled parts. Fasten the chairs upside-down on the back of the table using blocks and other extra scrap that will stop the part from moving side to side and from lifting. Create the pocketing toolpaths based on the model that was developed. We used epoxy to join the acrylic legs to the wood seat so leaving a healthy gap in the Mortise was desirable since the epoxy would fill in any extra space. This entry was posted on January 11, 2011 at 4:29 PM and is filed under a.n.t., How-To / Tutorials with tags Digital Fabrication with furniture, Digitally Fabricated Chair, Furniture making. You can follow any responses to this entry through the RSS 2.0 feed. You can leave a response, or trackback from your own site.